After seeing York and Leavitt play a classic in the Class B West final, the Deering and McAuley girls wanted to play one of their own. They certainly accomplished that, as McAuley won a heart-stopper of a game, winning 41-40 in overtime to claim the Western Maine Class A Title. Marissa MacMillan would get Deering off to a good start, scoring the first 4 points of the game. McAuley would answer with an 11-2 run as Alexa Coulombe and Rebecca Knight combined for 9 points. Deering would end the quarter on another 4-0 run, and the Rams were down 11-10 after eight minutes of play. The teams traded baskets in the second quarter, as the defenses clamped down. Knight scored 4 more points to finish with 9 for the half as the Lions held a 19-18 lead heading into halftime. The first half only took 25 minutes to play, as both teams limited fouls and turnovers. The teams played even to start the second half, as it was clear neither team was pulling away in this one. Kayla Burchill would hit a 3-pointer with under 30 seconds to go in the quarter to give Deering their first lead since midway through the second quarter. It was Deering with a 28-26 lead heding into the fourth quarter. Freshman Ally Clement played well beyond her years in the fourth quarter. Clement hit two big baskets and displayed excellent ball-handling for the Lions. 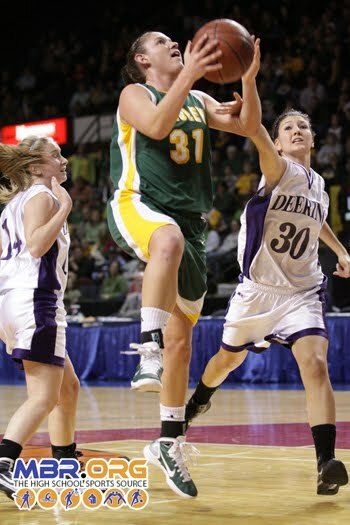 Burchill would find herself at the free throw line throughout the quarter, and she would find herself there at the end. The Deering star was fouled with .5 seconds left after it looked like the Rams wouldn't get off a shot down by 1 with 10 seconds to go. Burchill would hit the first free throw to tie it, but miss the second one. The game needed an extra four minutes to be decided. Coulombe made a big 3-point play for McAuley as they took the early lead. Burchill would answer with a basket. Knight hit a free throw to push the Lions lead to 41-39 with the clock winding down. Burchill would head to the free throw line with 9 seconds to go, and the weight of the world on her shoulders again. She again would hit the first free throw to cut the deficit to one. She again would miss the second, and Ella Ramonas' attempt off the rebound clanked out and went out of bounds. McAuley got the inbounds play off cleanly and ran the final seconds off for the victory. Alexa Coulombe was named the Capt'n Eli's Soda Player of the Game after pacing McAuley with 17 points. The Lions will play for the State Title on Saturday night at the Augusta Civic Center. Stay tuned for the game replay.